Calculus: Understanding Its Concepts and Methods is a complete electronic textbook featuring live calculations and animated, interactive math graphics. It uses the included Scientific Notebook® program to display text, mathematics, and graphics on your screen and to provide an interactive environment including examples with user-defined functions, calculus animations, and algorithmically generated self-tests. This environment encourages a focus on mathematical problem solving, experimentation, verification, and communication of results. 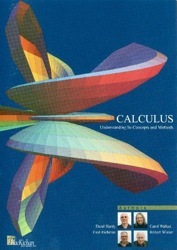 This electronic book covers the content normally taught in a three-semester calculus sequence. The material is presented in a way that encourages mathematical problem solving, experimentation, exploration, and communication. It includes explanations, examples, explorations, problem sets, self tests, and resource information. Many of the files contain animations that you can manipulate and control. Other files are interactive: you can define your own function, or change some parameters, and observe the results. This allows you to achieve important insights from specific examples. Calculus: Understanding Its Concept and Methods is thoroughly indexed and hyperlinked to provide easy access to relevant information. It is appropriate for independent study, as a supplement to any standard calculus text, or for distance learning. Calculus is the mathematics of change and approximation. With the computer algebra system in Scientific Notebook®, you can interactively explore examples and carry out experiments. The skills you develop will help you to solve problems you encounter in the future because you are always dealing with natural mathematical notation and general problem-solving methods.